Today’s guest is one severe, disembodied dude. The preponderance of hair, almost meeting twice on both the middle and sides of the forehead, makes me think of dark alleys and unpaid loan sharks. Henry William Fischer came out of Yonkers just before World War II and the lightness of his Wikipedia article testifies to the relatively small impact his career made on 1960s baseball. He pitched for Boston in parts of two seasons and (surprisingly) threw the best ball of his life there, despite going 3-5 with 1 save in only 15 games. He only batted in 9 of them, so probably served as a spot reliever and emergency starter, and didn’t appear in the postseason. 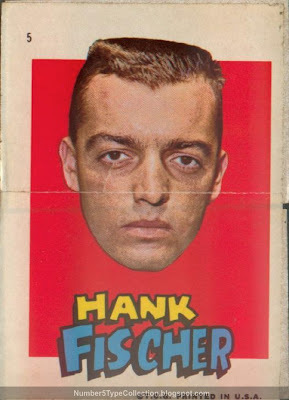 Unrealized potential aside, Hank does appear in one of Topps’ more interesting 60s oddball issues. They printed two teams’ worth of paper-backed stickers in 1967, one of the Red Sox (who finished 9th in the AL in 1966), and another picturing the Pirates (who finished 3rd). Fischer's a good example of the Red Sox design, which screams “it's just a test issue, don't spend more than 10 minutes on each sticker.” Bodiless players float, smirk, and grimace over paste backgrounds and primary color shapes. Three stickers portray a boyish rooter with an art style usually seen on card backs. It’s amazing that this amateurish look preceded the 1969 Topps Supers (Yaz image linked) by only two years. I assume they circulated in their team-specific markets, both a short truck ride from T.C.G. headquarters in New York City. Kids probably slapped these stickers on folders, wrapped them around bike frames, and otherwise made the set hard to finish. Most hobby examples come in decent shape, if only because collectors prefer unstuck versions. Lower grades often still possess a back, but exhibit stains, pen marks, or creasing. Mr. Fischer, around G/VG, came to my collection from eBay for $5. I recommend that type collectors get a hat-wearing player with a decent looking photo, even if it limits your selection somewhat. Joe Foy, George Scott, and Rico Petrocelli all look like sharp fellows you’d take home to Mama Binder.